Designed by leading golf course architect Karl Litton of Florida, this is an established par 71, 18-hole championship golf course, one of the Caribbean's premier golfing venues. 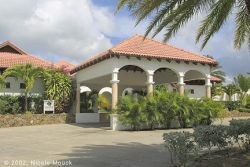 Adjacent to the Jolly Harbour Marina and surrounded by excellent shopping and beaches, it is set in lush tropical parkland. Easterly breezes cool you on the fairways that have been sculpted into green hilly landscape, with seven lakes to make this 5,587 yards golf course more challenging. The club includes, clubhouse with proshop, snack bar, showers and locker room. Open to visitors on a daily fee basis, we also offer special rates for weekly, monthly and yearly rates. We also offer special rates for weekly, monthly and yearly memberships. Corporate Memberships are also available on request. We would be happy to host your office or company golf tournament, call today for tournament rates. HAITI AUCTION - MAKE A BID NOW!